Some time ago – six months, to be exact – we announced a bracket-style boxed macaroni and cheese face-off. 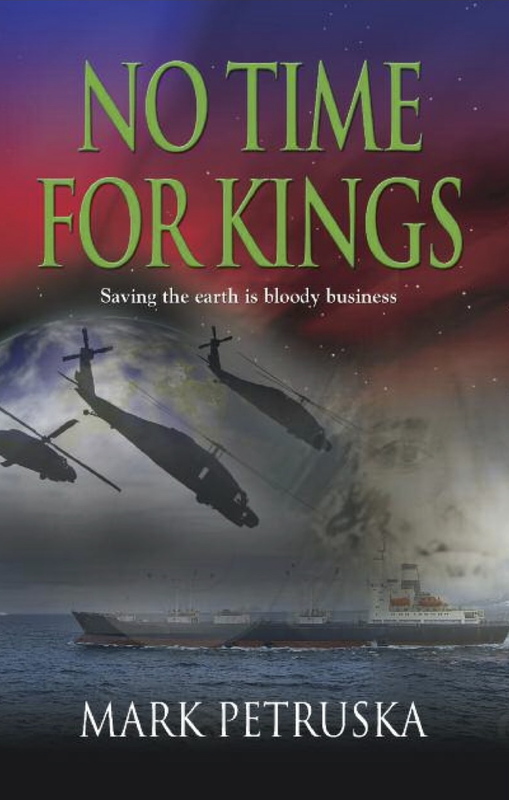 “This is something that will take awhile,” we warned, so if nothing else we were true to our word. I just didn’t expect half a year to pass before we got to round 2. The winner of the first challenge, in case you don’t remember, was Trader Joe’s, by a vote of 2-1. Sorry, Kraft. In the end, you were too overly processed. In the second round, we pitted two organic contenders: Annie’s and Horizon. In the interest of fairness, we chose the same flavor, as well. 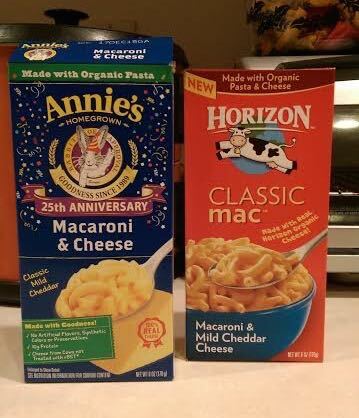 Each box is labeled “classic” and “mild cheddar.” And they both feature animals – Annie’s has a rabbit, Horizon’s got a flying cow. Or maybe he’s leaping. Probably trying to get away from the butcher, but we can pretend otherwise. Both brands advertise no artificial flavors or preservatives. Horizon goes a step further and touts no artificial colors, while Annie’s proclaims there are “no synthetic colors.” Instead, they use annatto – derived from the seed of the achiote plant – for coloring. This is not an uncommon practice; annatto has long been used to add orange coloring to many cheeses, dairy spreads, baked goods, and snack foods. It beats the food dyes used by some manufacturers (that would be you, Kraft), so it’s not a knack against Annie’s, though annatto has been linked to food allergies in some people. 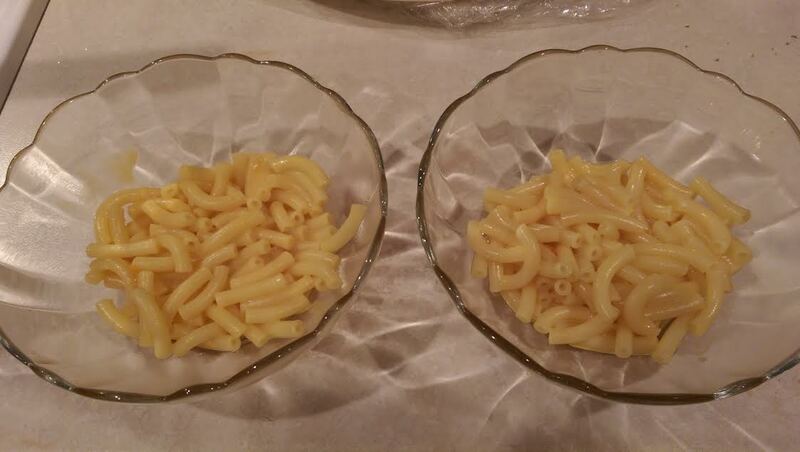 The color disparity was immediately evident when we emptied the “cheese packets” into each pot. Annie’s was bright orange, while Horizon’s was perfectly white. Once the milk and butter were added, however, the Horizon mac ‘n cheese magically turned orange. The only discernible difference is, the Annie’s had some unappealing clumps of cheese that would not dissolve. This was also the case with the Trader Joe’s brand, but that one was declared the winner, so I was not concerned about this. It all comes down to flavor anyway. And this time, the results were unanimous: all three of us chose the same brand, and to be honest, it wasn’t even close. The winner of the second round? We thought it was creamier and had a much cheesier flavor than Annie’s, which was pretty bland. So, it’s on to the final round: Trader Joe’s v. Horizon. All that’s left in the boxed category are various store or generic brands, and we really don’t expect much from those. We’ll let these two national brands duke it out for bragging rights. And this time, we won’t wait another six months. I promise!